The highlight was definitely, as usual, the birds around the waterhole. This little kettle pool with heavy undergrowth all around it and in it attracts birds like Britney Spears attracts paparazzi. Watching two Rusty Blackbirds, the first I’ve seen in Forest Park, forage along the edge of it was worth the walk in and of themselves, but when I got to see a Common Grackle next to a Rusty Blackbird I was amazed at how the rusty was dwarfed. If I had a picture I’d share it but I don’t, so instead I’ll show you another bird that was new for Forest Park for me, a Fox Sparrow. And, no, that is not snow in the background but litter. Sigh. Also at the waterhole I was surprised to see my usual sitting rock had been co opted for use as a platform feeder. I didn’t mind as I just sat on a nearby log and watched the birds come in to feed. 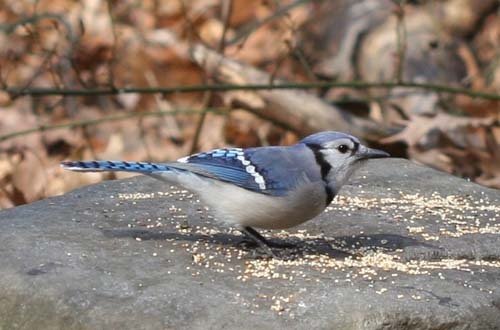 I was amazed at the diversity of birds eating the seed: everything from Red-bellied Woodpeckers to Black-capped Chickadees to this Blue Jay. But I was really surprised when a Hermit Thrush jumped up on the log in front of me, in almost the exact spot the Carolina Wren had, and posed for a brief second. And I was even more surprised when the same Hermit Thrush made its way over to the rock-as-platform-feeder and proceeded to scarf down seed. I had never seen a Hermit Thrush eating seeds before but I guess it makes sense for this oft-wintering thrush. It did get me perhaps the oddest trio of birds in one shot that I’ve managed to get yet. Well, you do seem to get more Rusties than the Great Lakes region. And Fox Sparrows are alsways great, the bee-eaters of the sparrow world, so to speak. Corey, your “trio” picture is priceless. That is so cool to live near such an area as Forest Park – truly your home away from home. It would definitely be mine, too, if I lived in your area. Hermit Thrushes have also surprised me by eating from our backyard feeders. Particularly one winter when one (I assume it was just one) became fond of the hulled sunflowers and shelled peanuts. I guess it just takes a class un-conscious hermit to stoop to such behavior! Those are great captures! The Fox Sparrow with wings spread and the trio including a Hermit Thrush on the rock-what a nice view! 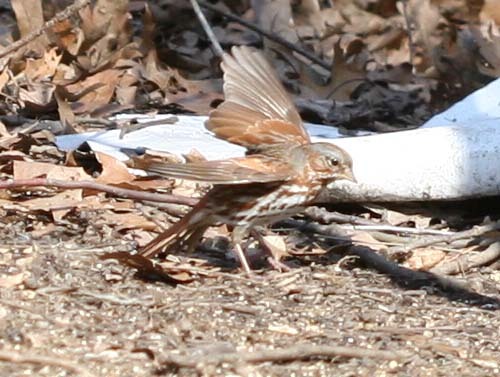 @Jochen: Rusties just seem to like NYC…and nice desctiption of a Fox Sparrow. @ Mary: Thanks…and once the warblers start arriving en masse I’ll be out there even more! 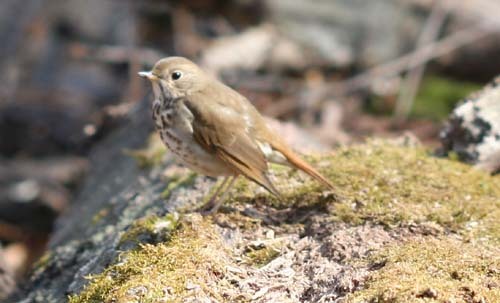 @Patrick: The Hermit Thrush really did seem somewhat discombobulated. @Grant: Proletarian Hermit Thrushes? Who would’ve thought? What do you get a bird-lover who has everything? 10,000 Birds T-shirts Are Magic!